This is possible because the rotation angle of the teeth can be adjusted by 90°. However, a parallel orientation is the most common. Helical gears are often called spiral gears when mounted on shafts at right angles. Helical gears are used in applications similar to spur gears, which is the simplest type of gear, also called the “straight-cut gear.” Spur gears are straight-sided along the gear wheel’s axis, with straight teeth radiating in alignment with the axis. 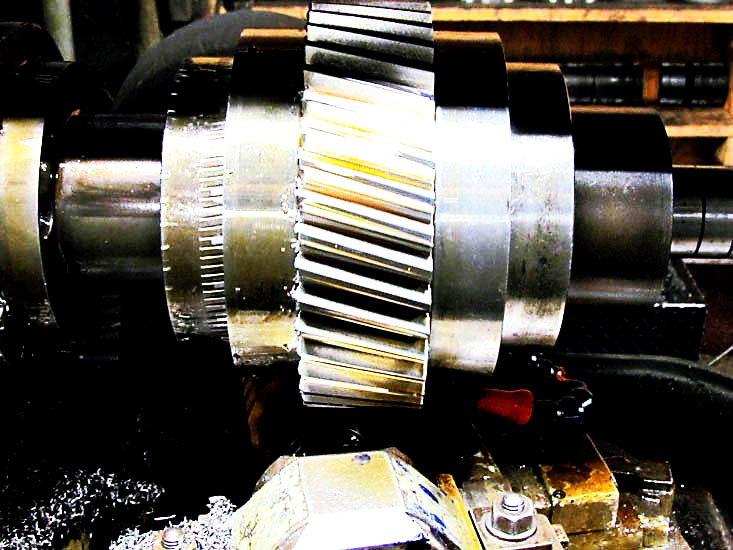 Offering a more refined design, the teeth in helical gears are cut so that they are not parallel to the axis of rotation, but instead are set angularly.The overlapping tooth contact of helical gears provides smoother, quieter functioning than spur gears, as well as making them better suited for high speed and large power transmission applications. There are also double helical gears, also referred to as herringbone gears, which offer two sets of teeth set in a v-shape. 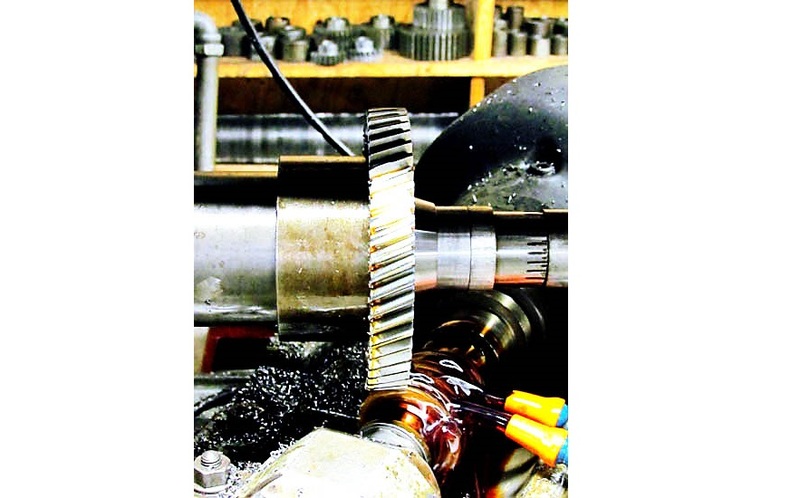 Examples of double helical and helical gear applications include presses, clay working machinery, sand mullers, rolling mills, feed drives, conveyors, cutters, blowers, compressors and manual transmissions. Due to their wide-ranging applications, numerous industries utilize helical gears such as textile, marine, food processing, oil and gas, rubber, steel, mining, packaging, medical, defense and automotive. A helical gear has two major circles: an outside circle and a pitch circle. The outside circle is determined by the distance around the outside edge of the helical gear’s teeth. The pitch circle is unlike the outside circle; it can be found at the point where the teeth of two gears mesh. There are two key configurations of helical gear connections: parallel and non-parallel. In a parallel configuration, a pair of helical gears is used to connect parallel shafts. These gears must have the same pitch, pressure angle and helix angle, but must be opposite hand gears. Opposite hand gears refers to right hand and left hand helical gear configurations. Helical gears must be one or the other and the configuration is easily identified through whether the teeth appear to be leaning to the right (right hand) or to the left (left hand). In a non-parallel configuration, a pair of helical gears is used to connect non-parallel shafts. The helical gears must have the same normal pitch and normal pressure angles, but can be the same or opposite hand configuration depending on the angle of the shaft. Helical gears can be used in conjunction with worm gears, which have teeth arranged around a cylinder-shaped gear like a screw. In order to be actuated, the helical gear interlocks with the screw-like worm gear so that the axes are perpendicular. When interlocked by engaging the teeth of the helical gear and the worm gear, the contact starts at one end of the tooth and gradually spreads as the gears rotate. In this situation, the worm usually drives the gear, providing a high level of speed reduction. However, helical gears are most often used in conjunction with another helical gear. Helical Gears Helical gears are circular in shape with teeth that have been cut in a helical path at an angle relative to the gear's axis of rotation. Helical gears can also be aligned parallel or crossed, allowing gears to transmit torque perpendicularly.